• Strong, flexible, polyurethane elastomer. 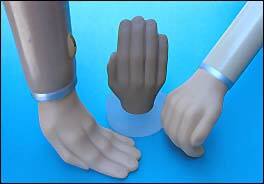 • Realistic anatomical features molded into back-hand surface. • Smooth, scoop-shaped, volar (palmar) surface. • Natural bar “Approach”, “Capture” and “Swing control” elements. • Free-Flex devices extend, flex and absorb shock under external force then rebound to original shape using stored energy.